The DRG Hepcidin 25 (bioactive) HS ELISA kit is a solid phase enzyme-linked immunosorbent assay (ELISA) based on the competitive principle. Serum Hepcidin-25 has been shown to add value to identify and differentiate specific disease conditions. Hepcidin deficiency causes hereditary hemochromatosis, characterized by body iron overload that may progress to liver cirrhosis. In addition, low Hepcidin-25 concentration can be induced by iron loading anemias and chronic hepatitis C. In contrast, high Hepcidin-25 levels have been found in iron-refractory iron-deficiency anemia, during infection, chronic kidney disease, and after intensive exercise, explaining the high iron deficiency among athletes. 11-Jan-2019 DRG will exhibit at MEDLAB Middle East 2019! 06-Nov-2018 Free T3 and Free T4 ELISA launched! 04-Jul-2018 Please meet DRG @ AACC 2018! 18-Dec-2017 DRG will exhibit at MEDLAB Middle East 2018! 04-Aug-2017 New assays for DRG:HYBRiD-XL: Beta hCG and Free Estriol! 27-Jul-2017 Come meet us at AACC 2017! 28-Feb-2017 DRG will exhibit at MEDLAB Asia Pacific 2017 in Singapore! 17-Jan-2017 DRG will exhibit at MEDLAB Dubai 2017! 15-Aug-2016 DRG:HYBRiD-XL is online in LAB Book 2016! 13-Jul-2016 Calprotectin: Completely automated on DRG:HYBRiD-XL! 30-Jun-2016 Come meet us at AACC! 01-Jun-2016 New DRG:HYBRiD-XL assay AFP is available! 29-Apr-2016 DRG exhibits at HOSPITALAR 2016! 12-Feb-2016 Award Ceremony of the German Design Award! 10-Feb-2016 DRG will exhibit at MEDLAB Asia Pacific 2016 in Singapore! 21-Dec-2015 New assays for DRG:HYBRiD-XL: LH and Prolactin! 14-Dec-2015 DRG exhibits at ARAB Health 2016! 03-Sep-2015 New DRG:HYBRiD-XL assay Insulin is available! 08-Jan-2015 DRG will exhibit at ARAB HEALTH 2015! 28-Nov-2014 New DRG:HYBRiD-XL assays DHEA and DHEA-S are available! 06-Nov-2014 D-dimer for DRG:HYBRiD-XL available now! 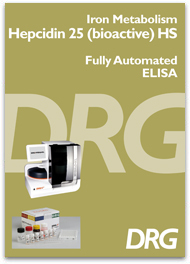 17-Oct-2014 New DRG:HYBRiD-XL assays TSH and free T4 are available! 20-Aug-2014 HbA1c for DRG:HYBRiD-XL available now! 01-Jul-2014 Join DRG at AACC 2014! 26-May-2014 New DRG:HYBRiD-XL Parameters available! 31-May-2013 CTGF ELISA biomarker for chronic liver diseases! 08-Mar-2013 Chlamydia and TORCH ELISAs CE certified! 03-Sep-2011 New DRG Building officially dedicated! 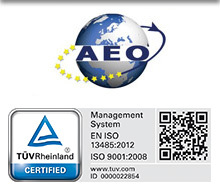 14-Apr-2011 New certificate for DRG list B products available! 24-Aug-09 WORLD'S FIRST HEPCIDIN TESTING KIT NOW AVAILABLE !